One of the features proposed for PHP 7.2 or next PHP version is the arrow functions. This is somewhat similar to the macros that exist in other languages, although it is not exactly the same thing. This was one of the main topics discussed by Manuel Lemos and Arturs Sosins on the episode 81 of the Lately in PHP podcast. In this episode they also talked about other proposals for future PHP versions like Deprecating bare words that are used as constant strings often by mistake, type checking when calling shared libraries with the FFI extension, a generic HMAC hashing function, namespaces for core extensions, support for strings with national characters for PDO prepared statements . 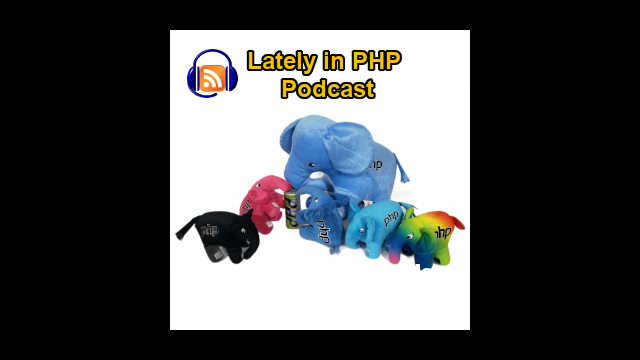 OK, so first we are going to cover just briefly what have been the latest releases of PHP 7 and PHP 7.1. It seems last month there was no update for PHP 5.6, that is in security maintenance mode. That means no security issues, nice, or maybe not exactly during that interval but I think they are always security concerns. Anyway then we move on to a topic regarding deprecating and removing bear words. Bear words are sometimes accidents when you forget to maybe put a dollar sign before the name of a variable and the current behavior of PHP is to quote it and treat it like a string that can lead to some inconveniences so the proposal is to somehow change the behavior and remove it in the future PHP versions. Anyway the next proposal is about and I think it is an extension called FFI foreign functions interface allows of you to call some DLLs or shared object library and the proposal is not well formatted here but here you can read it better it is about to tell what are the types that are expected for functions of those shared libraries, so if there is a type mismatch at runtime, it could trap it maybe be through an exception I think. Well anyway this is a proposal. It is not yet a RFC as far as I could understand but it is something that is for an extension that is available from PECL that would allow to call those shared libraries called FFI. The next topic is about as a so-called the arrow functions. Basically you could call some code. It's sort like macros that you just define some function which immediately to call some short code. It would be equivalent to returning some expression. So the idea is to simplify the way you call your code. The next topic is about HKDF. This is I confess this is something that is not easy to understand because it is related with cryptography and hashing and the idea seems to be to define a way to define these hash based functions that they usually use HMAC scheme. Anyway moving on to the next topic it is about using namespaces in core. This is for now a proposal. It is a bit confusing at least for me. Maybe Arturs got it much clear but it seems to define which namespace would be associated to core functions, core extensions, so you could have alternative implementations that would not collide with core implementations but the functions would have been the same name. And finally there is a topic related with extended string types for PDO. Basically this is something that I do not recall I have ever used but is to support national character types when passing parameters of string type to PDO.